Duke was born Doug Elwin Erickson on January 15, 1951 in Nebraska. 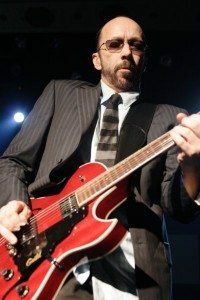 He plays guitar in Garbage and is a founding member of the band. Duke met Steve in a bar and through him he ended up meeting Butch Vig. this is a key part in the history of Garbage as it was basically the time the 3 founding members met for the first time. Butch and Duke played in a number of bands prior to Garbage such as Spooner, Firetown and Rectal Drip.